Iris has a rainbow of colorful experiences, from visiting the Underworld to conversing with her crush in this Goddess Girls adventure. 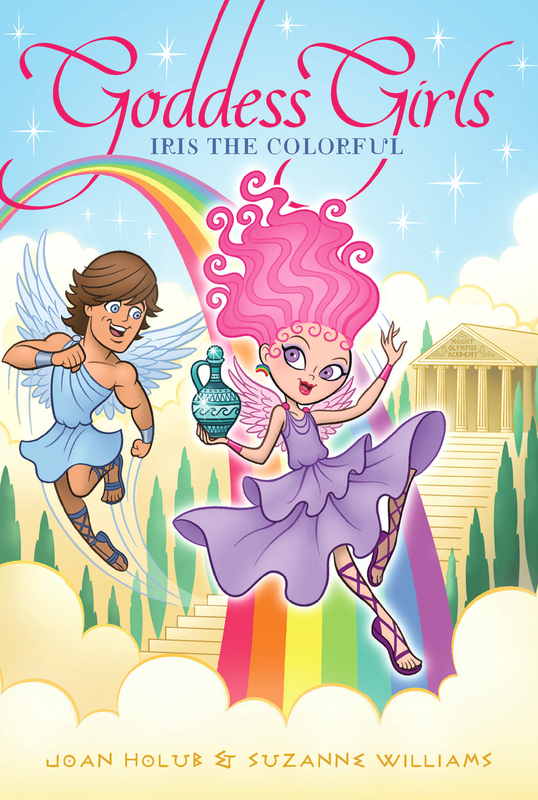 Iris is the most colorful goddess girl at Mount Olympus Academy. In fact, her hair and delicate wings can change color according to her mood! When Principal Zeus entrusts her with the job of fetching some magic water, Iris is tickled pink—until she realizes she’ll have to get the water from the gray, gloomy River Styx in the Underworld! And when Iris figures out how to create magical rainbow slides that will allow her to travel from Mount Olympus to Earth and back in a flash, she suddenly becomes a messenger in high demand. All the while, Iris wonders whether her crush, Zephyrus, has caught wind of her infatuation, or if he’s into her BFF instead. Either way, Iris is determined she won’t go green with envy! IT’S RAINBOW TIME!” IRIS ANNOUNCED. She narrowed her lavender eyes and drew her arm way back as though she were going to throw a spear. Her BFF, Antheia, the goddess of flowering wreaths, turned to watch the sky expectantly. Both goddessgirls were standing out on the Mount Olympus Academy sports fields on a beautiful, happy Sunday. Brrrng! There was a sound like the strum of a harp as Iris hurled what she held in her hand toward the sky. But what she threw wasn’t a spear. It was a streaming, gleaming ball of magic! It left her fingers, trailing long flowy ribbons of iridescent colors. When it reached the sky, it curled, looped, and blossomed into a big bouquet of brightly hued flowers all made of light. Other Academy students on the fields looked up, pointed, and smiled at her creation. Antheia jumped up and down, clapping in delight. Her bouncing made the cute wreath of ferns and berries that encircled her straight brown hair like a crown tilt sideways. “That was amazing! Do some more,” she urged as she straightened her wreath. “Okay.” Iris was tickled pink at her friend’s enthusiasm. Literally. Her hair was actually turning various shades of pink, from coral to bubble gum to fuchsia. It often did that, changing color to match her outfit, her mood, or just because. In fact, as she looked around the sports fields now for inspiration, her hair slowly shifted through all the colors of the rainbow, from red to orange to yellow, green, blue, indigo, violet, and soft shades of all the colors in between. “Hmm. What should I make?” she murmured, tucking her long wavy hair behind her ears. A light breeze had begun to blow across the fields, and the small sparkly pink wings at Iris’s back fluttered gently. Just then her gaze fell on the four members of the Goddessgirls Cheer Squad practicing over by the bleachers. Athena, Persephone, Aphrodite, and Artemis were apparently working on new cheers. Many immortal students went to the Academy—all of them beautiful, handsome, powerful, and awesome, with softly glittering skin. But these four girls were the most popular of all the goddessgirls at MOA. Athena was the goddess of wisdom and inventions, among other things; Persephone was the goddess of flowers; Aphrodite was the goddess of love and beauty; and Artemis—a skilled archer—was the goddess of the hunt. And Iris’s BFF, of course, was the goddess of flowering wreaths. Lucky them! Seemed like almost all the immortal MOA students were the goddesses or gods of something. However, even though Iris was a goddess, too, she wasn’t officially the goddess of anything special. Which was so majorly lame. She loved rainbows and was good at making them. If only Principal Zeus would recognize her special skill and name her the official goddess of rainbows! Well, somehow she was going to make that happen. And that was the reason she’d come out to the fields to practice creating different-shaped rainbows this morning. Iris wound up again, then threw. Brrrng! Another ball of magic left her fingers. Streaming colored ribbons of light, it sailed in a high arc overhead to form three huge, gleaming blue-and-gold letters: MOA. Blue-and-gold pom-poms that actually shook appeared around the letters. Aphrodite was the first to notice the colorful letters and pom-poms and pointed them out to her three Cheer Squad besties. All four girls smiled and waved to Iris in thanks. “Could you get your rainbows to make music? Or fight enemies?” Antheia suggested. The Goddessgirls Cheer Squad had huddled together after spotting Iris’s pom-pom rainbow moments ago. Now they broke apart to do a thank-you cheer for her that they’d made up on the spur of the moment. Iris grinned and waved back. Antheia laughed and waved too. “Make me a trident rainbow for good luck!” a boy called out to Iris. It was Poseidon, the godboy of the sea. He was holding up his trident, which was a fancy three-pronged pitchfork that dripped seawater. He and a godboy named Ares were downfield, having a contest to see who could throw the farthest. As Iris watched, Ares chucked his spear halfway down the field, and a roar went up from the boys who’d gathered around to cheer both him and Poseidon on. Quickly Iris tossed out some magic and created a trident-shaped rainbow for Poseidon, then a spear rainbow for Ares. More requests came, and she continued making rainbows to represent the sports that different godboys and goddessgirls were doing on the fields. With each new design the other students erupted into whoops and clapping. When she shaped a bow and arrow rainbow in the sky, a boy shouted, “Nice!” It was the dark-haired, dark-eyed godboy Apollo. He usually practiced archery with his twin sister, Artemis. But since she was doing Cheer, he was practicing with Eros, who was also amazing with a bow and arrow. The golden-winged Eros was concentrating on a distant target now, the string of his bow drawn back. When he released his arrow, it flew straight to the target’s heart. Zing! Iris and Antheia watched Apollo punch a fist into the air in approval. Afterward he said something to Eros, then turned and jogged toward the two girls, clutching a rolled-up piece of papyrus in one fist. Iris sensed Antheia’s excitement rise and saw her cheeks redden. As would be obvious to anyone, Antheia was blushing. However, only Iris could also see the air around her friend turning a pale rosy-red color. This was an aura, which was sort of a full-body halo. All her life Iris had been able to see colorful auras like this around people, which indicated their emotions or moods. After years of practice, she knew what the different shades of an aura meant. For instance, a deep red one meant embarrassment. However the air around Antheia was turning the kind of pale rosy-red that indicated liking. Uh-oh. Though Iris wasn’t as good as Aphrodite at divining who was in like with who, she knew what this particular aura meant. It meant that Antheia hadn’t given up on her dream of Apollo becoming her crush. Unfortunately. Iris wasn’t surprised by this request. MOA students often asked her to add colorful flourishes to the borders of special letters, or even to do face-painting at times. She might not have been a fine artist, but her talent with colors extended to special decorative touches. She’d added embellishments to lockers, dorm room walls and bulletin boards, and even to secret notescrolls students passed in class or left in someone’s locker. She darted a glance at Antheia. Iris was sure that the scroll Apollo held out to her was meant for a mortal princess named Cassandra. Had Antheia guessed this too? Cassandra’s family owned the bakery that made Oracle-O fortune cookies in the Immortal Marketplace, which was located below Mount Olympus and had shops that sold everything from the newest Greek fashions to yarn, cosmetics, and thunderbolts. Cassandra’s family lived in an apartment above their shop. “Hi, Apollo,” Antheia suddenly piped up in a hopeful voice that was higher than her usual one. Iris groaned silently. That girl just would not give up! She couldn’t seem to accept that her dreams of Apollo ever like-liking her were doomed. Everyone knew he was in like with Cassandra. But that fact hadn’t stopped Antheia from wishing it could be otherwise. “Oh, hi, Antheia,” Apollo replied, looking a little uncomfortable. His aura had turned yellow–green, which suggested to Iris that he suspected Antheia’s crush but was too cowardly to tell her that he wasn’t interested in returning her affection. Godboys were mostly strong and forthright when it came to sports or battle, but crushes were a subject they usually tried to avoid. “How about asking Aphrodite to add something cute, instead?” Iris suggested to him. “Maybe some hearts and stuff. She’s the goddess of love after all.” If she didn’t take the scroll he held out, maybe he’d leave quickly so her friend could calm down. Poor Antheia. Iris had tried hinting to her that her fixation on Apollo was impossible, but Antheia just didn’t seem to get it. So Iris simply did what she could to discourage her friend’s doomed crush. She even pointed out other cute and interesting guys now and then with the hope of steering her toward another boy. “Well, she’s busy with Cheer, and I’m kind of in a hurry to send this letterscroll to . . . someone,” said Apollo. Beside her, Antheia looked momentarily elated. Ye gods! thought Iris. Was she actually hoping he meant the scroll for her? This was not good! Instantly Antheia wilted, looking like Apollo had just shot down her hopes with one of his arrows. So she really had been daydreaming that he’d planned to give her the letterscroll. Surely she must know better. Still, Iris knew what it was like to hope for something so hard. And with all her heart she wanted to believe that her dream of becoming the goddess of rainbows wasn’t as doomed as Antheia’s crush on Apollo. Sensing that the insistent godboy wasn’t going to give up, Iris gave in and said, “Okay, sure, I’ll decorate it for you.” She took his scroll over to the bleachers near where the Cheer Squad was practicing, while Antheia and Apollo followed. She always carried a set of preloaded colored-ink pens around just in case, and now she whipped them from the bag she’d left on the bleachers. She chose three pens—a bright blue, a flamingo-pink, and a lime-green. Quickly she unrolled and flattened the scroll facedown on a bench seat so no one could accidentally read the private message on its other side. Then she proceeded to draw a cute border on the outside of the letterscroll with the three different-colored pens at once, adding rainbows, bows and arrows, and swirly flourishes. After a few minutes she glanced over at Apollo, who had been admiring her work. “Want me to draw her name on the outside too?” Although she was in a hurry for him to go, she wanted to do a good job. Apollo nodded enthusiastically. “That would be mega-cool!” While he watched Iris form and decorate the letters of Cassandra’s name, Antheia stared at him with a besotted expression. Which didn’t really make much sense, thought Iris. Antheia seemed too head over heels in like right now to notice that, though. And she didn’t have a chance to say more to him because just then an MOA goddessgirl named Pheme zipped over. She’d arrived almost out of nowhere, it seemed, her sandaled feet hovering a few inches above the ground. As she touched down, the small, glittery wings on her back stilled. Iris had always had wings, but Pheme’s wings were a recent gift from Principal Zeus, which made them extra special—a reward for heroism during a fiery battle. The girl’s wings were a cute shade of orange, the same as her lip gloss and short, spiky hair. Iris’s wings were cute too, but unlike Pheme’s, they were too delicate for flying. Like her rainbows, they were decorative, not functional. “What’s wrong with you?” Pheme asked Antheia first thing upon landing. Oh no, thought Iris. She must’ve noticed how Antheia was mooning over Apollo. Pheme was the goddess of gossip and rumor, so you had to be careful around her. She noticed everything, and telling her anything was the same as shouting it to the whole school! “Nothing’s wrong with her,” Iris answered for her suddenly tongue-tied best friend. “Come on. She’s blushing. What’s up?” Pheme was studying Antheia in a super-interested snoopy way now. As always, when the gossipy girl spoke, puffy cloud-letters formed above her head so that anyone who happened to be looking could read her words. Seeking out juicy gossip and sniffing out rumors was sort of like Pheme’s job at the Academy. Plus, it gave her material for the gossip column she wrote in Teen Scrollazine, which was a mega-popular ’zine read by mortals and immortals alike. Iris finished her drawing and stood, handing the letterscroll to Apollo. “This is perfect!” he proclaimed, smiling down at her work. “What of it?” said Apollo, blushing. “I want to read it!” Artemis made a playful grab for the scroll, but he held it away, high above his head so she couldn’t nab it. Antheia sighed softly, watching him go. Iris touched her friend’s arm, lending support. Truth was, Iris had once like-liked Apollo too. At first he’d seemed the perfect fit for her. He was into poetry and she was good with rhyme and colorful writing. He was interested in weather, especially the sun; and you needed sunlight to make a rainbow. For a while Iris had thought they were destined for each other. But then, Antheia had suddenly announced to Iris that she liked Apollo. It hadn’t been easy, but Iris had backed off without even telling Antheia about her crush on him. She looked over at Pheme, who had begun quizzing Artemis about the squad’s new cheers. It was really lucky that she hadn’t guessed about Iris’s and Antheia’s crushes on Apollo. Lucky also that she hadn’t guessed when Iris had gotten her very first crush back in sixth grade. On Poseidon. Many of the girls at MOA had liked the turquoise godboy of the sea at one time or another. That is, until they’d figured out he was as shallow as the pools in the fanciful water fountains he designed around the Academy and on Earth. So it wasn’t really all that surprising when Antheia had declared in sixth grade that she liked Poseidon—before Iris could say it first. Iris had backed off then, too. They were best buds, and as far as Iris was concerned, that meant you didn’t steal each other’s crushes. However, she really wished they’d stop liking the same guys! As far as her more recent crush on Apollo went, it had turned out that he was more into sports and the telling of prophecies and fortunes than into weather science and magic and color, as Iris was. They didn’t have much in common after all. Cassandra, on the other hand, was way into fortune-telling. So she and Apollo really were perfect for each other. And unfortunately for Antheia, during a recent event involving a magic carousel at the Immortal Marketplace, Apollo had decided he liked Cassandra. “Hey!” Apollo yelled when he was halfway back to the target-shooting range. Iris turned to look and saw that a sudden gust of wind had whooshed the letterscroll right out of his hands. It flew a dozen feet up in the air, where it was tossed and tumbled end over end, before being shot across the sky and flung high into the bleachers. “Hey!” he yelled again. He was chasing it now, coming back toward her, Antheia, and the other girls. He took the steps up the bleachers two at a time, but just as he got close enough to grab his scroll, another gust snatched it away. “Wow! The wind’s picking up,” Pheme noted. All around the sports fields, trees were swaying, and leaves on the ground were whirling in small tornados. “Godsamighty! You’re not kidding,” said Artemis when a sudden gust knocked her into Antheia. “I wonder what’s causing it,” mused Iris. She pushed back strands of her hair that had blown into her face, and looked at the sky, half-expecting to see Hermes in his delivery service chariot dipping lower. Sure enough, she spotted his chariot. But it was leaving MOA, a speck disappearing into the distance, and was too far away to have created such a strong breeze. “Drat,” said Apollo. He’d paused in his chase to look up as well. He was obviously disappointed to see that he’d missed Hermes’ daily pickup and delivery already. “Whoa!” squealed Aphrodite. Iris looked over to the far end of the bleachers to see that an unusually strong gust had tangled the girl’s long golden hair. Now another rush of wind whisked Apollo’s letter-scroll toward Iris’s group. When it landed by their feet, Artemis picked it up. Apollo loped down the bleachers, taking them two at a time again, till he stood before Artemis. “I missed Hermes. And Zeus asked me to catalog some poetry in the library today, so I can’t take the scroll to the IM myself,” he said. He held out a hand toward her, motioning for her to give him the scroll. Shooting him a mischievous grin, Artemis held it away. “What about our archery practice?” she asked with a raised eyebrow. “Sorry, Sis. Okay if we skip it? I already promised Zeus to do that library stuff.” He made a grab for the scroll, but she was too fast and held on. But then, seeming to take pity on him, she nodded and handed it over. Apollo tapped one end of the scroll in his opposite palm. “I really wanted to get this to Cassandra this morning. It’s—” Noticing that Pheme was there, he clammed up. “Why not call up a magic wind to take it to her?” suggested Artemis. Magic winds were random breezes or small gusts of wind that came when summoned and delivered letterscrolls here and there. However, truly important documents and messages, and heavy packages, were usually entrusted to Hermes. Apollo brightened. “Really? That’d be great. Thanks!” He handed the scroll to Iris, who stood closest to him. Startled, Iris took it, glancing at Antheia in surprise as Apollo took off for the library. The girls had made no plans to visit the IM. After a morning on the sports fields, they’d talked about getting lunch in the MOA cafeteria, then hanging out in the dorm room they shared on the fourth floor of the Academy. So why had Antheia said that? Iris could sense that Pheme’s nosy-o-meter was on high alert. So far the spiky-haired girl hadn’t seemed to guess what was up with Antheia’s one-sided crush. And feeling protective of her BFF, Iris did not want Pheme to figure it out. Iris was good at keeping secrets, so she’d never understood Pheme’s complete inability to safeguard them for even two seconds. But the gossipy girl couldn’t help it she supposed. Any more than the other girls could help their talents, like Persephone’s ability to make things grow or Athena’s gift for figuring out difficult math problems. Hoping to distract Pheme, Iris shoved Apollo’s scroll into her bag and then drew her arm back. She sent a new ball of magic hurtling high into the air. Brrrng! In mere seconds a traditional arched rainbow arced across the sky. It stretched so far that it was impossible to see where it ended! Gasps sounded across the fields. And whoops of surprise and delight. It was the first time Iris had managed such a huge rainbow, so she was kind of delighted herself. “Wow! I think that one almost made it to Earth,” said Pheme, excitedly taking notes for her gossip column. “What did you just say about ‘sensible juice’?” Pheme interrupted, having misunderstood Iris’s last two words. With a wink at Iris, Antheia corrected Pheme. “No, she said, ‘bendable spruce.’ ” She pointed at the trees that were still whooshing in the wind. Then she went on chatting with Pheme, trying to throw her off the gossip track. But Iris barely heard. She reached out to touch the fantastic rainbow she’d made. Was this one solid enough? she wondered. Did she dare try . . . riding it? “WHO DID THAT!” boomed a thunderous voice. Iris jumped in surprise. So did everyone else on the fields. Then, like all the other students, she looked up to see the one, the only—Principal Zeus! He was flying high overhead, his wild red hair blowing in the wind as he rode his white-winged thunderbolt-carrying horse, Pegasus, across the sky. Returning from duties down on Earth no doubt. Zeus was a busy and powerful guy. Not only was he the principal of the Academy. He was also King of the Gods and Ruler of the Heavens! “I said, WHO DID THAT!” Zeus repeated, sounding even crankier now. He was pointing at her rainbow. Everyone turned to stare at Iris. A hush settled over the sports fields. Oops! Iris’s eyes widened as she realized what she’d almost done. Or rather, what her huge rainbow had almost done. On its way through the clouds, apparently, it had nearly beaned Zeus! His bushy red eyebrows bunched into a V-shape and he frowned more deeply now. At her! The muscles in his arms bulged as he held the reins of mighty Pegasus, and sunlight flashed off the wide gold bands he wore around his wrists. Sparks of electricity prickled around him, a sure sign he was angry. “You dare try to strike me with your rainbow!” Zeus roared at her. “Strike you? No . . . Uh, I,” mumbled Iris, too scared to form a sensible reply loud enough for him to hear. “My office! Twenty minutes!” he commanded. Gulp! So much for this being a happy day! thought Iris.